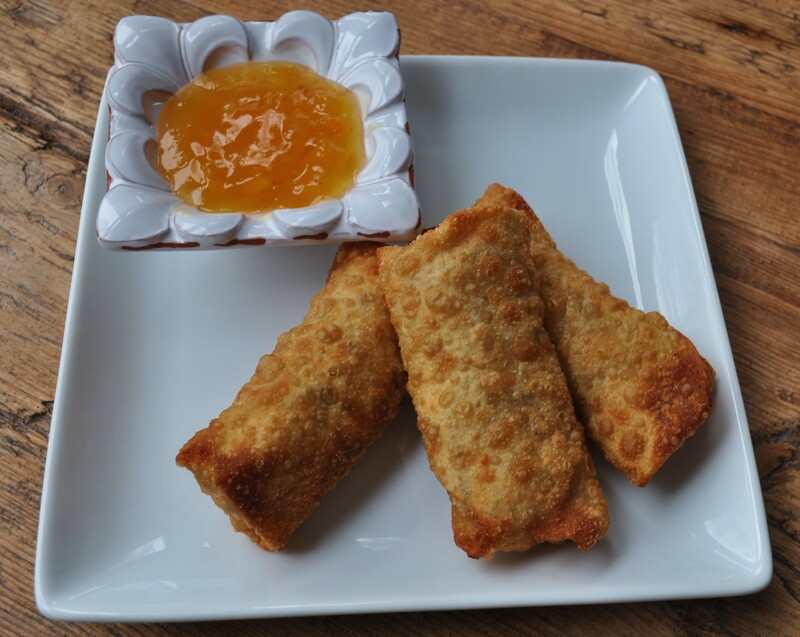 Egg Rolls | The Sassy Spoon: Fun Food! There are many plays on the egg roll. This one is perhaps the “classic” to most Americans, as it is the type we grew up with. A crispy egg noodle exterior, filled with savory flavors and lots of interesting veggies. You do not have to follow an exact recipe, play around with different fillings, different herbs and all kinds of sprouts and greens. 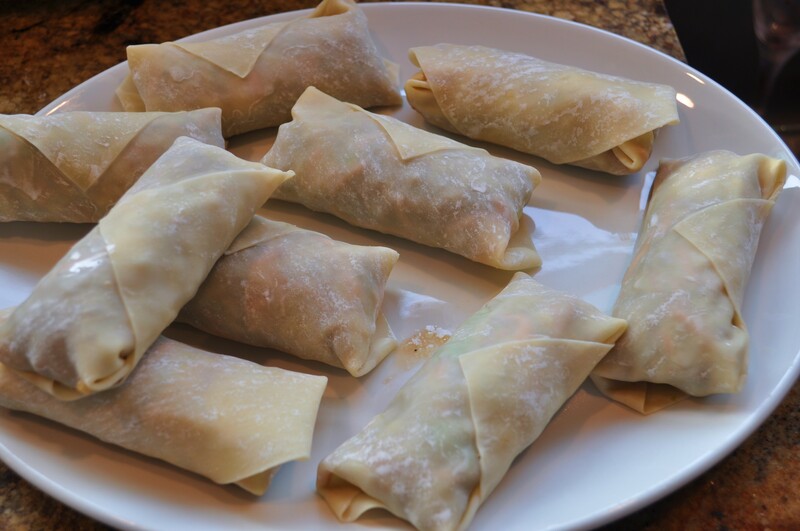 The Vietnamese make them with a rice flour wrap. 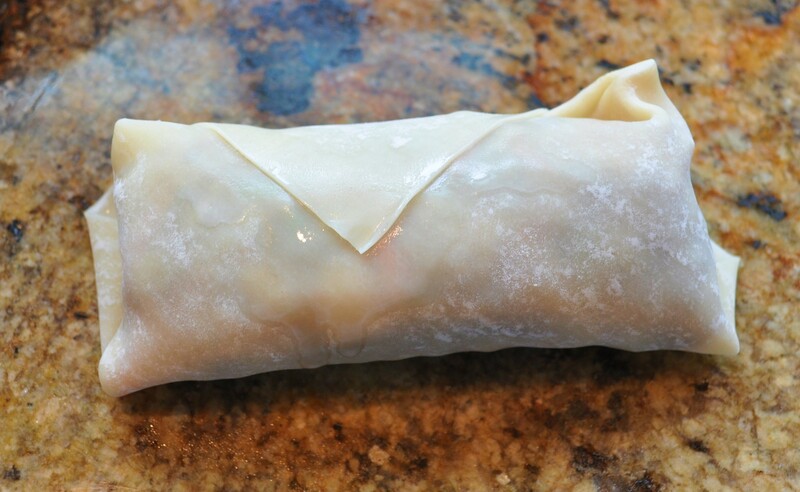 Spring rolls are the same concept except uncooked, those utilize the rice flour wraps soaked in water to soften them. OK… back to the basic egg rolls. This is so easy and everyone LOVES these! You will never buy those frozen ones again! I like to use pork sausage, you can also chop up some cooked shrimp or chicken. In a hot wok or skillet brown the sausage (or other meat) once browned toss in the veggies and saute. Your mixture should be 1/2 veggies and 1/2 meat. Add some Hoisin, Fish Sauce or Oyster Sauce, just enough to moisten (I prefer the hoisin). Cool. & Chill the filling for 30 minutes. Now comes the fun part! Let’s Roll! 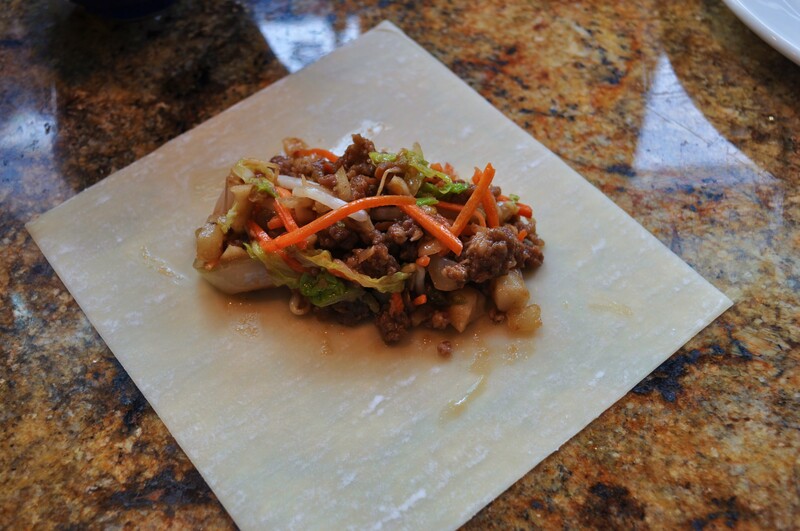 In four steps you roll up the egg rolls. Brush on an egg wash (1 beaten egg with 1 Tbs of water) on all seams as you fold. After they are rolled, place on a plate or if you are making a lot, on a tray. If you are frying, heat 4″ of canola or rice bran oil to 350 degrees and fry till golden brown on both sides (about 5 minutes). Drain and serve hot. 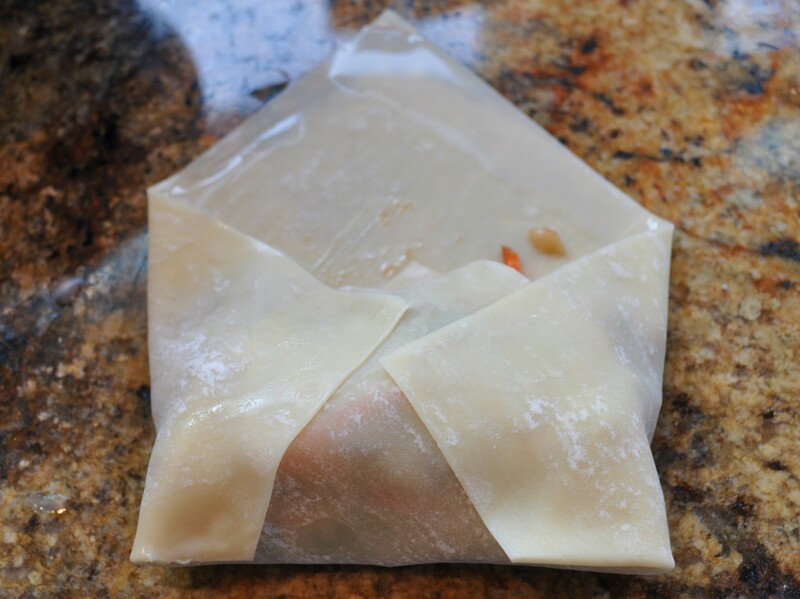 If you are baking, spray a baking sheet with oil, then place the egg rolls on the baking sheet. Preheat the oven to 375. Then bake for about 25 minutes, till golden and crispy. For sauces, you can use many different sauces, the easiest are prepared Duck Sauce, Hoisin Sauce or Sweet Chili sauce. All are available in most any grocery stores. 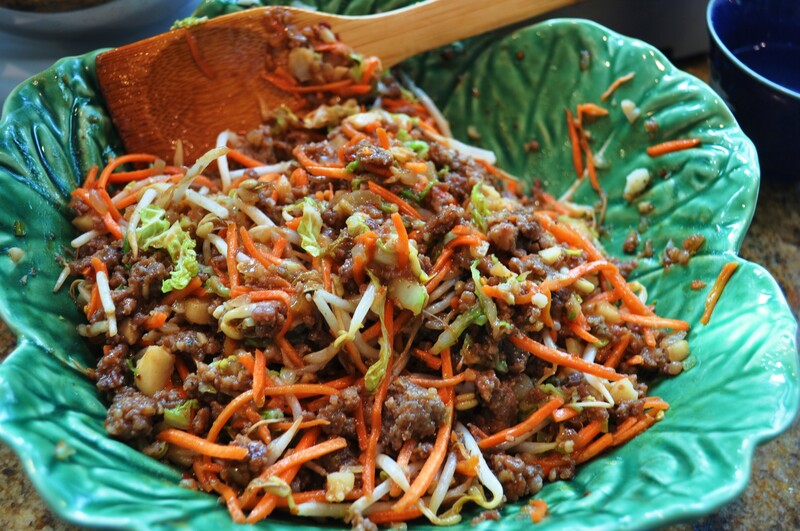 If you are doing the vietnamese version, it is worth it to find a recipe for Nuoc Cham. Here is my friend Andrea Nguyen’s recipe. These are better when freshly cooked. The wraps and filling will last at least 10 days in the fridge. You can crisp up leftover cooked rolls in a 350 degree oven for 10 minutes. You can also make the rolls before cooking and freeze them on a baking sheet. 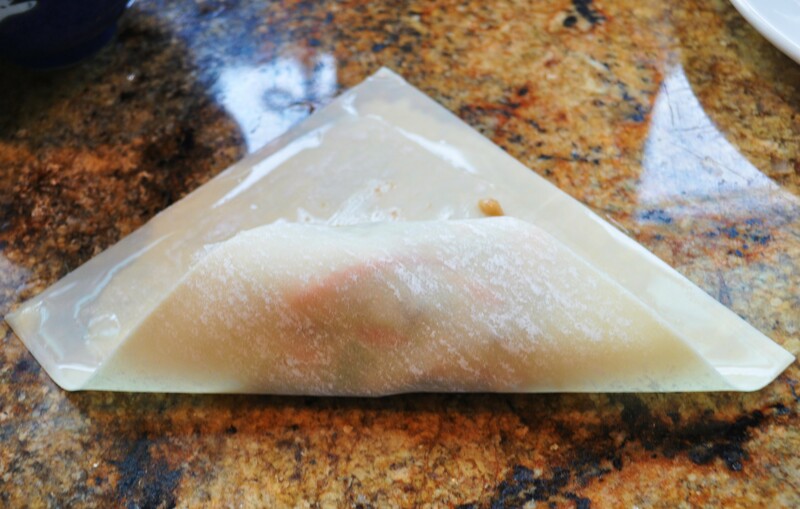 Once frozen, just put into freezer bags and they will be ready for your next party. Fry or bake as directed.